The ad-supported application LeapSense should help you “leap across the web” with ease. Nonetheless, our malware researchers state that you would make a huge mistake by installing this unreliable browser extension on your operating system. Luckily, the official download page leapsense.net is not active. Unfortunately, the advertisement-supported program could be distributed in other ways. 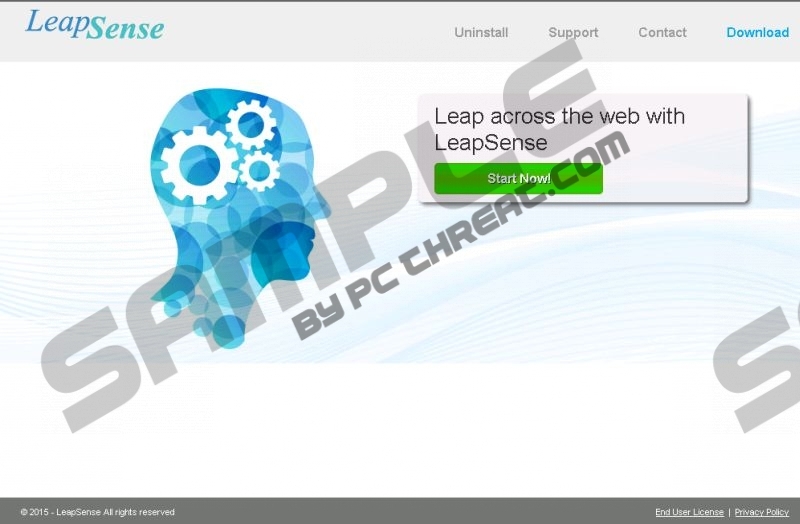 All in all, you will need to remove LeapSense from your PC, regardless of how it enters your operating system. LeapSense is yet another creation of SuperWeb LLC. Even though you may have no knowledge of this company, our malware researchers have analyzed and removed hundreds of programs created by it, including Tanzuki, Shamanul, and Zap Tilla. All of these applications require removal for the same reasons, because all of them are identical! Despite the differences in the representation, we can guarantee that you will be able to delete LeapSense in the same way that you would delete other SuperWeb adware. Have you discovered the "Ads by LeapSense" and "Provided by LeapSense" advertisements when surfing the web? If you have, we are sure that the advertisement-supported program has been installed on your PC. If you do not remember installing the program, it is likely that you have downloaded bundled software without even knowing it. Unfortunately, this means that you may be unaware of much more devious programs that are active on your PC. If you suspect that you may have to remove LeapSense-related malware from your computer, we advise installing a malware scanner to check this. Some computer users do not want to delete LeapSense, because they think that the advertisements delivered by this application are completely harmless. In fact, if you click on the ads, you may be redirected to sites that cannot be trusted. Would you click on an ad if you knew it routed to a site offering a fake installer? Of course, you would not. Unfortunately, it is difficult to say which LeapSense ads can be trusted and which cannot. Therefore, we suggest removing LeapSense and applying a more reliable tool to enhance your web browsing and help you find authentic savings deals. Delete LeapSense from your operating system using our removal instructions. Then examine your operating system with a malware scanner. If some files of the advertisement-supported program will remain active, the scanner will warn you about it. The scanner will also inform you which other programs require removal. If you are thinking about installing reliable security software to guard your PC, you should install it and allow it to remove LeapSense automatically. Select Control Panel to access a menu presenting more utilities. Identify LeapSense, click it, and select Remove. Navigate to the bottom-right corner of the Metro UI screen to access the Charm bar. Quick & tested solution for LeapSense removal.